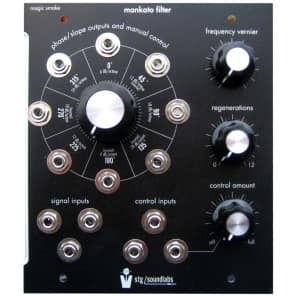 The Mankato Filter is a four-pole lowpass filter with positive and negative outputs at every pole, giving you slopes of 6 dB/oct, 12 dB/oct, 18 dB/oct, and 24 dB/oct simultaneously. 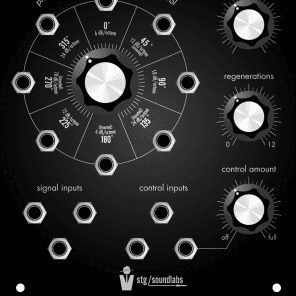 the negative slope outputs allow you to use the Mankato as a quadrature sine oscillator with 8 available phases. the Mankato will self-resonate from subaudio to superaudio, and responds to one volt per octave through its unattenuated control inputs. 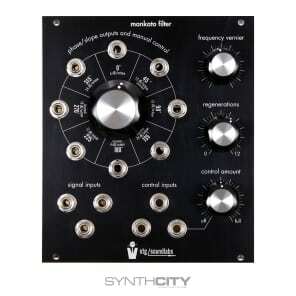 the signal inputs are DC coupled, which allows you to use the Mankato as a voltage-controlled slew limiter. An audio demonstration of the filter can be found here. it is a 5-track composition using the Mankato for something on every track, and it is the only filter used in the piece.